This two story year round cottage is on a quiet lot at the tip of Lobster Cove in Boothbay Harbor with tidal frontage! Swim from the rocky shore, or just dip your toes in to the cool Atlantic waters at high tide. At low tide explore the exposed rocks and hidden wonders of a Maine tidal cove. Relax on the 10' x 24' front deck and watch the tide as it comes and goes. This home offers a King size bed in the second floor master bedroom, and a first floor bedroom with a queen size bed. Walk a 1/2 mile to the east side of the harbor for fresh cooked lobster dock side (or get live ones to go), or continue across the foot bridge to down town for shopping, dining, boating excursions, and entertainment. deck with table & chairs etc. 1 King, 1 Queen, 2 Full Baths, Washer and Dryer, Deck furniture, Hot Air Heating System, Linens can be provided for a small fee, Cookware (including a lobster pot) and utensils provided, Non-Smoking The Cottage rents weekly, Saturday to Saturday during the Summer months. My husband and I (from DownEast Maine) and my sister (from Albany NY)!planned a Christmas get together at this perfect cottage. Our annual pilgrimage to the Gardens Aglow was the reason for our visit. Our Christmas dinner was easily prepared in the well stocked kitchen as was our morning coffee. The cottage was spacious with plenty of comfortable seating. David and Linda provided us with everything we needed including a "casual" check in considering the off season visit. Did I mention the setting? Absolutely beautiful! My husband and I enjoyed our morning walk on the Boothbay Region Land Trust trails just down the road. Given the time of the year we chose to drive downtown but a walk over the footbridge is not out of the question. Highly recommend a visit! Great Hosts - the property was exactly as advertised. Nice cottage that would comfortably hold a family, though only 2 of us were there. All that you need to enjoy a week is provided. 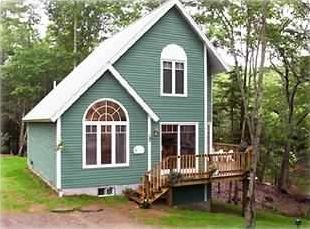 Lobster Cove Cottage is the perfect slice of paradise. From the moment we arrived it was so peaceful. In the mornings, we enjoyed sitting on the back deck and listening to the birds while drinking our coffee. Lots to see and do close by including many delicious seafood restaurants. Charming details abound through out the cottage leading to a real vacation feel. Looking forward to visiting again! I, along with three of my friends, spent a wonderful week at Lobster Cove. The house was just as described. Check-in and all contact with the Fosters was easy and efficient. The house was very clean, comfortably furnished, quiet and close to downtown. The walk into town is about a mile and easy for those accustomed to walking a bit--there's a park on the way. The kitchen has everything you need for cooking. The house is very convenient to grocery and restaurants. The deck, the swing and the adirondack chairs near the water are comfortable and provide a great place to relax and read! We had coffee most mornings on the deck! We thought the location was ideal and the shady deck was always cool and comfortable, great for having a cup of coffee in the morning and a glass of wine and reading a book in the late afternoon. The combination of seclusion and nearness to the town was fantastic. As far as the cottage was concerned we found it to be comfortable, clean, well outfitted, and very charming. In short we loved every minute of our stay. Very highly recommended. Cancellations: If you are compelled to cancel your reservation your rental fees will be forfeited. We will attempt to re-book this time to someone else. If we are successful in re-booking all or part of this reservation, proportionate fees collected will be refunded less a cancellation penalty of 10%. If we are unsuccessful in re-booking your time slot, all fees collected from you will be used to cover this reservation. The property rent weekly, Saturday to Saturday during the summer months.